Author’s Note: The latest and most detailed proposal is in a third post, “The Case for Lidding I-5 in Downtown Seattle”, dated December 4, 2015. Earlier this year I proposed capping Interstate 5 in downtown Seattle. The original idea was radical, and it received a flood of positive and negative feedback. This entry looks at the project more critically, dials it back to a reasonable scope, and includes additional details. I’m tackling this again because I plan to pursue it as a thesis for my master’s degree over the coming year. I chose not to update the original post in order to preserve it as a record, but to accommodate new readers I have repeated (and edited) some of the original content here. When President Eisenhower envisioned a great road system connecting the far-flung cities of the U.S. he didn’t quite expect the engineers to plow through entire neighborhoods. But that’s what happened, and the legacy is the concrete ribbons that divide our cities to this day. An example is right here in Seattle with Interstate 5 running north to Shoreline and south to Tukwila for about 16 miles, dividing Downtown from First Hill, Capitol Hill from South Lake Union, and the U-District from Wallingford. Amid rapid population growth and demand for residential and office development, now is the time to reclaim valuable urban land. 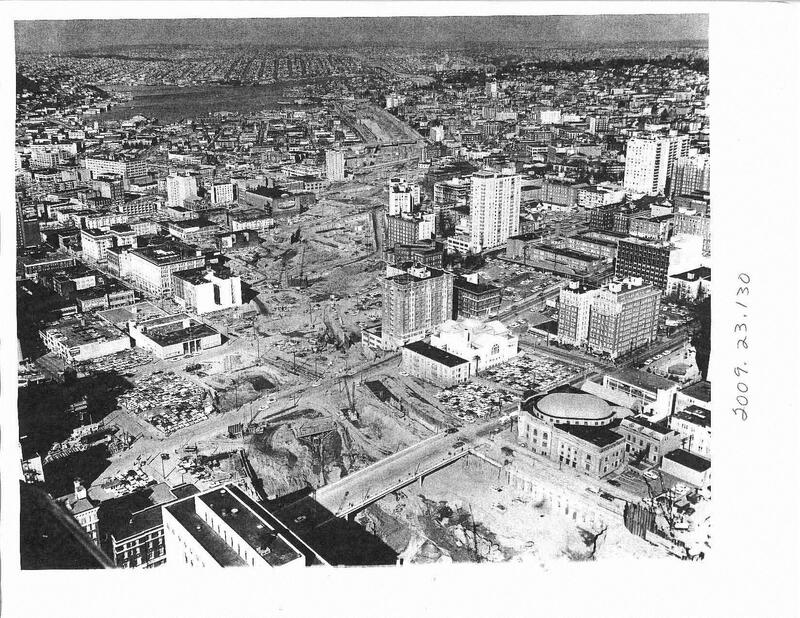 Demolition and construction through Downtown, circa 1960s. When the the Federal Aid Highway Act of 1956 guaranteed covering 90 percent of construction costs, the State of Washington immediately began planning I-5’s route through Seattle. Planners said Downtown “…contains older and less desirable buildings…from Marion Street to Denny Way — this section will traverse an area that needs improvement in appearance” (ironic emphasis added). Due to the area’s hilly topography, much of I-5 in Seattle cuts through the land with large retaining walls and elevated viaducts (rather than running flat on the surface). Part of the downtown segment is a trench with concrete walls on both sides. Paul Thiry, chief architect for the 1962 Seattle World’s Fair, suggested capping the freeway with a lid. Other proposals included building rapid transit in the median or tunneling underneath First Hill. Residents of First Hill organized the only protest, decrying the anticipated consequences of pollution, noise, decreased property values, and isolation from Downtown. But citizen opposition was ineffective and the route went unchanged. Eminent domain and federal funding were used to acquire a 300 foot right-of-way by purchasing and relocating or demolishing hundreds of homes and businesses. The Seattle section of the freeway opened to traffic in 1967. A decade later, Freeway Park became a concession to residents. It opened in 1976 with 5.2 acres of walkways, landscaping, and water features that cross over I-5 from 6th to 9th Avenues between Seneca and Union Streets. Its modernist form, in line with surrounding office buildings at the time, was designed by architect Angela Danadjieva from the landscape architecture firm Lawrence Halprin and Associates. Danadjieva went on to author a Freeway Air-Rights Development Plan for the area. The Washington State Convention Center, opened in 1988, is adjacent to the park and also stretches across I-5 with over 410,000 square feet of meeting and exhibit space. These examples provide clear precedents for bridging the freeway’s massive width, which has been further discussed and studied (PDF) in recent years. At one point a federal courthouse building was considered as a lid extension. I-5 has already been spanned with Freeway Park and the Convention Center. The Washington State Department of Transportation (WSDOT) owns the air rights above the freeway, so continued cooperation between WSDOT and the City of Seattle will be needed for future efforts. Indeed, original plans for Freeway Park had additional structures in the three blocks southward of the existing park. An expansion doesn’t need to strictly honor the previous design, though, as the park’s brutalist architecture has a variety of nooks and crannies that give it a reputation for crime, injuries, and homeless camps. But additions should follow its spirit as a momentary sanctuary from urban life. The motivations for covering up I-5 are numerous. Land is extremely valuable in the Downtown and First Hill blocks around I-5; a rough calculation based on parcel data from King County, using a range of land uses and parcel sizes, revealed an average land value of $18.1 million per acre ($416 per square foot). Amid explosive growth and a growing affordability problem, such a wide strip of underused land is increasingly attractive for private development, civic functions, and park space. More broadly, I-5 is a gash through the heart of Seattle, which is a city that prides itself on alternative transportation and reducing single-occupancy-vehicle use. While the city is moving forward with rebuilding the waterfront, it can also capitalize on this opportunity to improve the image of the broader Downtown area. Other issues include the unpleasant noise and exhaust fumes, though these nuisances haven’t hindered adjacent residential development. 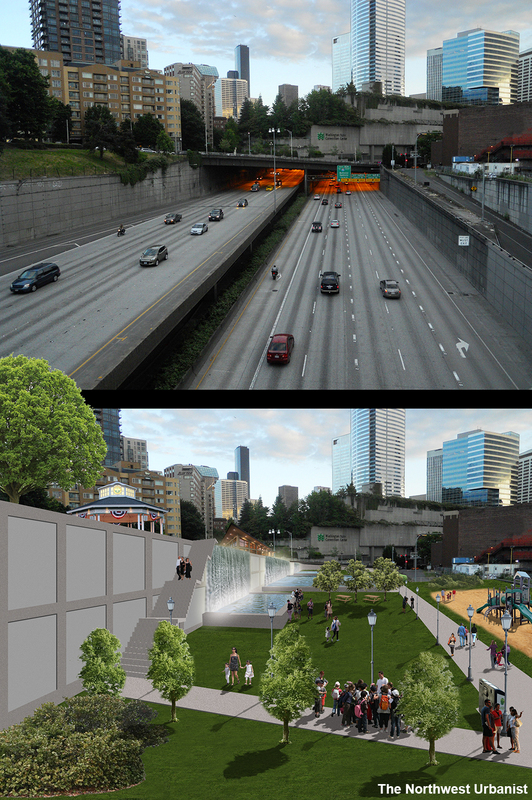 One option is puting I-5 in a tunnel. The under-construction Highway 99 tunnel just a few blocks away is a convenient example for a cost comparison. That project has a number of components, including new surface-level paving and demolition of the Alaskan Way viaduct; the underground activities have been allocated about $2.05 billion. At 2 miles long and 4 lanes, that comes out to about $1 billion/mile or $.25 billion/lane-mile. I-5 through Downtown is 14 lanes at its widest, including the reversible express lanes. Bertha, the tunneling machine working on Highway 99, is already the world’s largest with a diameter of 54 feet. To keep the same amount of lanes, an even larger machine would be needed for an I-5 tunnel, or four Bertha-sized tunnels would need to be bored parallel. The latter idea would have an estimated cost of $3.5 billion/mile. That is absurdly expensive, and does not even begin to consider the other costs of design, administration, and operation. And, of course, Bertha is expected to be inoperable for over a year, so this wouldn’t be a popular option. A non-boring option is cut-and-cover, a method in which a trench is dug and a roof built overhead. But long term lane closures, which would be necessitated by this method as excavation is done in the right-of-way, could be disastrous; I-5 carries some 250,000 vehicles and 50,000 transit riders per day (PDF) in Seattle and thousands of tons of freight up and down the west coast. The proposal’s scale has been significantly reduced. Click to enlarge. The best alternative, then, is to construct a lid over the existing lanes. The original proposal was ill-conceived and had the lid stretching from Yesler Street in Pioneer Square to Galer Street in Eastlake, a distance of 2.5 miles. Much of this route only has a retaining wall on one side or is slightly elevated, meaning the downhill side of the lid would require massive columns that would add cost and unsightliness. The preferred area is Downtown where the freeway is in a trench. The adjusted proposal is about three-fifths of a mile from end to end with eight sections, from Madison Street to Olive Way. South of Madison Street is a small section that could also be lidded, but is not included in this proposal. Future considerations could possibly extend south to Yesler Street and north to Denny Way, where the surroundings have dense conditions, though these sections would require the aforementioned additional engineering. Study areas of the project. Total area (in orange) of the eight sections is about 9.6 acres. Click to enlarge. The lid will be built with concrete and steel, with large beams spanning the trench and supporting the superstructure. Center columns will probably be needed in the medians, where existing overpasses are supported. The elevation changes from one side of the trench to the other, so the lid could either be sloped or terraced. Considering the length of enclosed roadway, the lid will create a tunnel that requires exhaust ventilation, fire suppression systems, lighting, and round-the-clock monitoring from WSDOT’s control centers. Height clearance, on- and off-ramps, and number of lanes can be preserved to avoid traffic impacts. The lid itself will have several layers, including a structural slab, drainage beds, and engineered soil. The bottom of Freeway Park. New lid sections would use similar construction. The soil needs to be lightweight but able to support plants, because the primary function of the lid will be a park that creates much-needed open green space for the dense Downtown. Like other parks, features can include playgrounds, sportsfields, walking and biking paths, pools, pavilions, and community centers. Plazas could be used for food vendors and public events like concerts, markets, and festivals. The presence of quality park space could also help draw more families to the Downtown as calls go up for bringing an elementary school to the neighborhood. Indeed, if no other space is found, which seems likely, a school can also be built on the lid. Conceptual view of a park on Section 4, looking south from Pike Street. Click to enlarge and see comparison. The original proposal made the case that the lid could support high-density private development. There are a few examples of towers being built in such conditions, such as New York’s ongoing Hudson Yards development, but it would drastically increase the costs of the lid structure. That said, it’s probably feasible for low-rise steel or wood-framed buildings, perhaps no more than three or four stories, to be built on the lid without adding cost. These buildings could contain a mix of retail, office, and residential space. The lid itself will be a place-maker, but putting people on top could create an even more unique destination and amenity. Conceptual view of a school on Section 8, looking north from Madison Street. Click to enlarge and see comparison. The primary issue with any large public works project is cost. Infrastructure costs are chronically underestimated due a variety of reasons (this paper succinctly discusses them), so what follows are educated estimates using previous projects. Nearby on Mercer Island, a half mile long lid over Interstate 90 was completed in the early 1990s in response to citizen pushback to that freeway’s construction. On top is the 20 acre Aubrey Davis Park, which has open space, playgrounds, trails, and sportsfields. The structure, ventilation, and soil cost $146 million. Converting that $242 million in today’s dollars and estimating the lid is approximately a half-mile long and 200 feet wide, an estimated cost is $20 million/acre. This is similar to the 5.2 acre Klyde Warren Park in Dallas, which was completed in 2012 at cost of $110 million, or about $21 million/acre. Freeway Park, in today’s dollars, cost $18.5 million/acre. Conceptual plans for each lid section. There is an opportunity to create a variety of designs within a small area. Click to enlarge. The eight sections of this proposal are about 9.6 acres total, bringing the cost estimate to $192 million. Conservatively rounding up pegs the cost at $200 million, which is 10 percent the cost of the original proposal. For comparison, $200 million can buy half the Columbia Center, two-thirds of a Boeing 747, 2.5 Jumbo Mark-II class passenger ferries, or 44 Space Needles. This cost is also more politically feasible and entirely within the city’s means to fund, as seen with the waterfront redevelopment ($420 million) and seawall replacement ($385 million). But, again, it is only an estimate. Funding is available from multiple sources. The City of Seattle can start with a “local improvement district” (perhaps call it a lid LID), which taxes surrounding private properties that benefit from a large public investment. This tool is expected to raise $200-300 million for the waterfront project. The waterfront is also being partly funded with money from the State of Washington, which will probably be willing to chip in on an I-5 lid like it did with Freeway Park. Construction bonds (borrowed money) or a citywide levy could also be used with voter approval. Also, like the freeway cap in Dallas, the City could partner with private interests to create sponsorships and solicit donations (Amazon Park and Starbucks Plaza, for instance). Parcels or buildings on the lid could be managed by a non-profit and leased out to fund ongoing maintenance and programming. Within a few years, the project will also support the increase of surrounding land values, and therefore property tax revenue for the City. The $115 million High Line in New York famously generated $2 billion in private development, for example. Like the High Line, the lid may also be a big tourist draw. Along with economic gains, the lid will have environmental and social benefits. Noise and air pollution will be significantly reduced, while new vegetation can support wildlife habitat and reduce the local heat island. People will have improved connections between neighborhoods and gain a new area to live, work, and play. After planning and design is complete, it might take two or three years to complete all eight sections of the lid. Construction will have traffic impacts, of course, but delays and congestion are nothing new for this stretch of I-5 (Freeway Park took about two years to build) and will be negligible considering the citywide benefit. Working on nights and weekends can limit impacts. Interstate freight and through-traffic can also be detoured to I-405, which is being widened. The lid also doesn’t have to be built all at once, as each section is unique. Locally, WSDOT is also planning and constructing two lids in the Montlake neighborhood and three in Medina over the reconstructed State Route 520. Other cities across North America have recognized the merits of covering up or tearing down freeways in their urban cores. In San Francisco, planners are studying removing part of I-280 and relocating rail yards to open up some 27 acres for housing and employment. Philadelphia is developing concepts for capping I-95 with an 11-acre park (costs estimated at about $18.6 million/acre) and bringing people back to its riverfront with residential and commercial development. And a recent study in Toronto recommends tearing down a three-level expressway to make room for new development. Chicago’s Millenium Park was built over rail sidings and parking lots. Freeways are vital for moving people and goods in a country as large as the U.S., but there is no reason for them to disrupt our downtowns and create barriers between people. 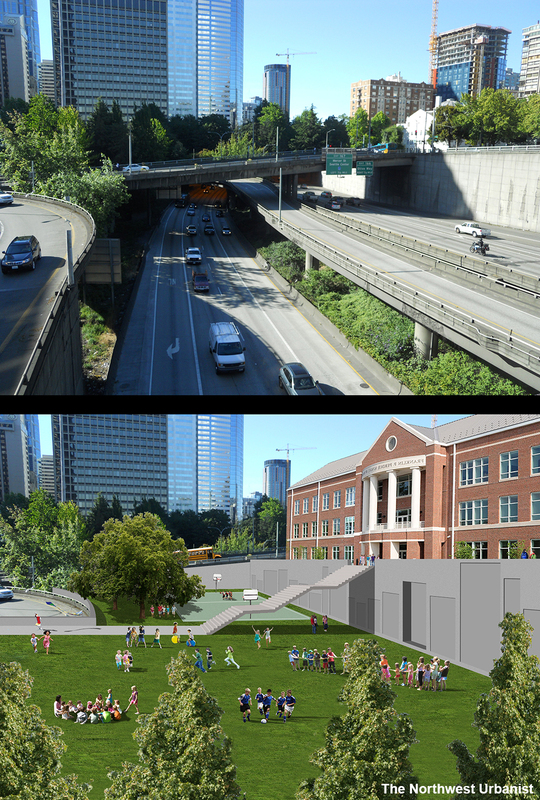 The proposed I-5 lid will create new space for parks, residences, and commercial development while improving connections between dense neighborhoods and drawing private investment to surrounding properties. And perhaps most importantly, the lid will redefine the character of Seattle’s downtown. If this interests you, subscribe by email and the Facebook page for future updates. You can also get involved with the local advocacy group Lid I-5, which is pursuing the same idea, or contact me. This entry was posted in Government, Housing, Land Use, Landscape, Megaprojects, Parks, Public Space, Schools, Sustainability, Transportation and tagged Bury I-5, cap, Capitol Hill, construction, convention center, Dallas, deck, downtown, engineering, First Hill, Freeway Park, I-5, Interstate 5, Klyde Warren Park, lid, Mercer Island, neighborhoods, Northwest Urbanist, park, proposal, redux, revision, school, Seattle, update, urban design, water. Bookmark the permalink. The most important thing is: the resulting redevelopment will not only pay for the initial cost of the I-5 lid, it will bring a huge profit for decades. This project should have no price tag, but rather the amount the city will earn… in billions. Second, the lid should be the base for several railroad lines that can serve future light-rail, Sounder, Amtrak and high speed rail lines – I envision an express railroad line alongside I-5 all the way to Everett to bypass the zigzagging landslide-prone Puget Sound shore route. Yeah I know some people would rather just replace I-5 entirely with high-speed rail, which isn’t a bad idea. It would be a momentous political battle. And indeed, it’s well-known that public investment can draw in private investment that pays for the public project in the long run. This is not only an exciting idea to pursue but you’ve also fleshed out the details to make it plausible, presuming folks can be enrolled to support it with investment. If more people could be included in the scope of the project then building initiative to support it would be easier. Wouldn’t it be a fine thing to fold lidding of portions of I-5 into a larger “reconnect Seattle” plan? Not all sections of I-5 are amenable but many other parts of the freeway’s path. would support “dense” (~4 block?) installation of pedestrian and bike bridges as well as some selective application of roadway bridges, the latter perhaps targeted exclusively to transit use. 55th St. N in the U-District is a fine example of how “burying” I-5 with bridges would be richly rewarding. The challenge of crossing the freeway as a pedestrian or cyclist is quite stark at that location. Landings and abutments for roadway bridges wouldn’t fit into the developed scheme of streets now dead-ending at I-5 but lighter bridge terminations are conceivable at many such locations as 55th. Main point: for relatively little additional cost, reconnecting Seattle in more places than only downtown might be a key means of bringing people under the same tent of support. Indeed, I’ve also heard of creating a bike/ped bridge across I-5 at 47th or otherwise greatly improving the existing 45th and 50th St. bridges, along with the possibility of building a lid between them. I think as Seattle grows more people could get on board with the “reconnect” idea to create additional open and civic space. What are your thoughts about adding an acoustic covering over the blocks, at each end of the lid? Maybe similar to the new noise barriers on the A7 in Hamburg. Something to help knock back the noise in those first two green blocks, making them truly enjoyable, rather than just pretty. Love the work you’re doing. This is how great projects are born, so keep it up! I have to wonder if long-term leasing just one of those sections, say section 1 between Olive and Pine, for some low-rise residential could bring enough money to subsidize lidding some of those other sections. At the very least, we should pressure for that little section 3 to be fully lidded when the Convention Center expands north of Pine. Thanks! It certainly doesn’t have to be built all at once, and your suggestion might be a good way to prove the idea’s worth to the public. It’s all about the money. I think several of London Bridge’s incarnations were funded by the houses and shops and grain-mills and fishponds built into it. This would be so wonderful. If it truly is something that could pencil out financially, I wonder if bonds could be sold to help cover construction costs? In the age of crowd funding, I’d love to chip in some money to help make my city a better place. It’d be a bonus to have the possibility of that money coming back with interest after the land atop the lid was sold. However it is financed, this really needs to be done. Good luck with the Masters, and I really hope you’re successful in shaping this into an executable plan. The city would be better for it. It’s so great to see that you are working on this. Given that I-5 is in a ditch I always wondered why they haven’t covered more of it already. This would greatly improve that part of town. a. In my opinion the wall breaks up the neighborhoods – not nearly as bad as the highway but it still does. b. Two high-prominence sloped parks that are very successful are Dolores Park in San Francisco and Gasworks Park here in Seattle. Slopes with a view are great places to sit and relax – especially if vendors of food and drinks are available. a. The target would be providing one contiguous park space spanning sections 1 through 4.
b. Pine and Boren undergo an elevation change when passing over the highway. To sink Pine, for example, starting from Melrose Avenue it would have to lose elevation at a higher grade so that it can go under the lid and emerge somewhere between Boren and Ninth. A good question is whether there would be enough space for a street under the lid while providing sufficient clearance for the highway lanes. Yes I think a sloped park would be fine too. I made at least one image of that on the original post, which is linked to in the beginning of this one. Any terraces would probably want multiple stairs/ramps to avoid the problem of isolating different parts of the park/neighborhoods. I’ve also considered whether it would be possible to lower some of the street overpasses to create some continuity, if nothing else than for a lazy river (how awesome would that be in a downtown?). I’m still on the lookout for actual drawings of the freeway but I’m guessing there is some height clearance that can be worked with. I’ll investigate all of this more thoroughly over the coming year. Hey Scott, I was reading about a partial retail cap in Ohio where they put a row of retail on both sides of a highway bridge which effectively made the highway disappear for pedestrians. The cost was lower than a full-on lid, yet because it’s retail it could even pay for the lidding. So I was thinking – how about capping the highway with retail space and putting a park on the roof of that? Speaking of the block between Pike and Pine – as we know the Pike-Pine corridor in both downtown and Capitol Hill is the most active pedestrian area in the city and is full of retail. If the gap in the corridor is filled that area is bound to attract a lot of retailers. Thanks for sharing the article! I think this would be worth looking into, especially the Pike-Pine area like you mention. If you shield the freeway from people, perhaps it wouldn’t make much difference whether the cap has 100% coverage or not. It could be more cost-effective while having more income-generating potential than a traditional park. Yes and you can still make the roof of that retail a publicly accessible park / walkway or accommodate for a future time when the entire block will be covered by the lid and it makes more sense for the rooftop park to exist.